Maybe it is the dreary and rainy weather, but all I can think about right now is curling up in front of the TV and staying in. I love home design and I have been dreaming of a new couch (the 10 year old slip-covered one we have is just not cutting it anymore). With new couch research comes lots of other ideas for the living room, bedroom, and rooms I don’t even have in my apartment! 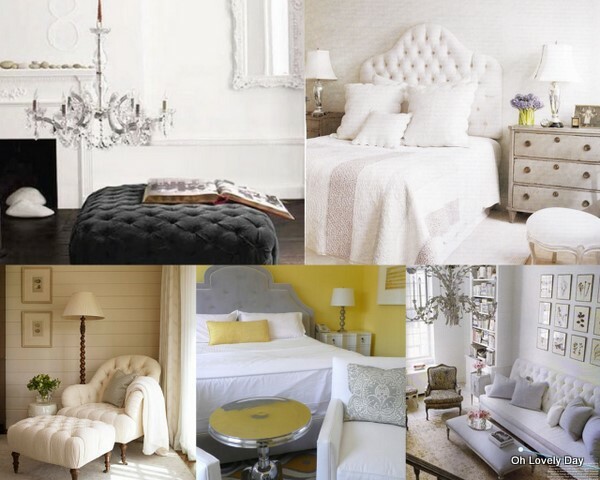 Here is a collection of photos I found on Decor Pad that are inspiring me. I am loving tufted furniture at the moment! 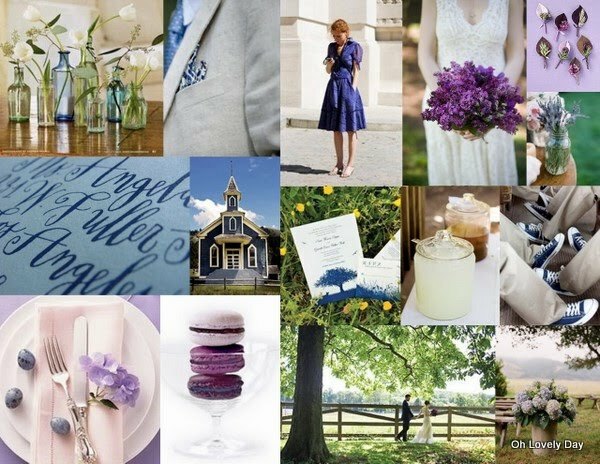 I’ve seen so many great DIY projects for weddings and loved doing projects for my own wedding, so I thought doing an inspiration board focused on DIY projects might be fun. One wedding in particular, featured on Style Me Pretty last week, was filled with so many DIY elements and I loved every one. The event was carried out beautifully and infused with so many personal touches I feel like I know the couple myself. You definitely need to head over to SMP and see the feature in its entirety! I hope this post will inspire crafty and non-crafty brides alike to find a project they can handle and personalize their wedding! The husband and I are headed out of town to visit some friends, so happy long weekend!!! 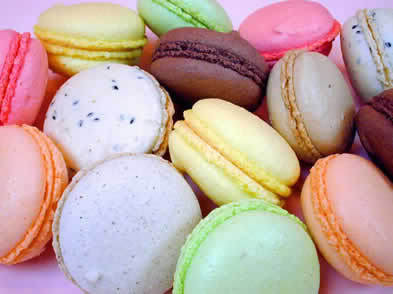 There is something about french macarons that I love. 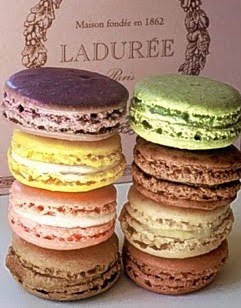 I don’t know if it is their yumminess, or the pretty pastel shades they come in, or that they make me think of Paris…but I know they make me happy. 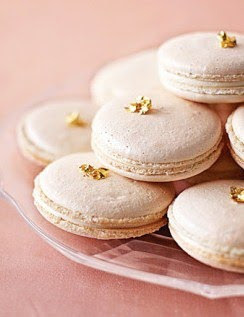 While I am more of a cupcake girl when it comes to desserts, there is just something so simple and lovely about french macarons. And they make beautiful pictures! 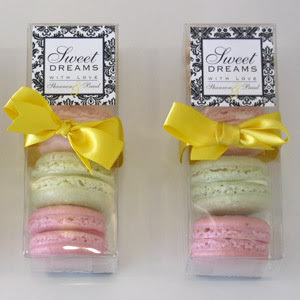 French Macarons would be a charming addition to any wedding dessert bar or would make great favors for guests. 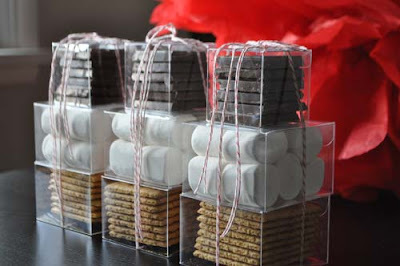 Many bakeries specialize in making them for weddings, or it could be a great DIY project for a bride! My favorite bakery, Vanilla Bake Shop, makes delicious macarons, among many other treats (including the cupcakes for my own wedding). Last month, Style Me Pretty did a DIY holiday feature where Vanilla Bake Shop shared tips and a recipe for making your own macarons. For the full feature on SMP, go here. Color & Flavor Coordinate: Presentation is key! You eat with your eyes first. Take that into consideration when you are making your French Macarons. Choose three flavor and color combinations that compliment each other and taste delicious. 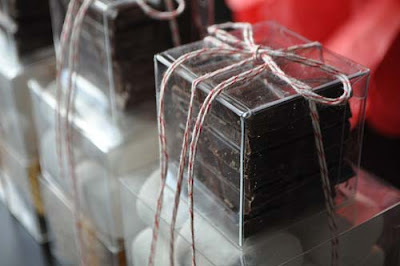 Personalize: Adding a personalized custom label to your favor is a sweet touch that is simple and inexpensive. A helpful online source is https://www.myownlabels.com/. Chose from a variety of label templates and colors. Cost: approximately .75 per label. *Oven temperatures vary. Test this recipe first, before you begin production to ensure the cookies bake perfectly. If the cookies crack on top, your oven might be too hot. Turn your oven down by 5-10 degree’s. The cookie should have a smooth shell top. *Chose three different food colors for your cookies and decide what flavor will correspond with the color. Example: A pale green macaron filled with mint chocolate ganache. *Gel based food-coloring works the best. Divide your batter mixture into three separate bowls, and add a different color per bowl. This will allow you to have three different colors and flavors. *Use a toothpick when adding the food coloring. A little goes a long way. 1. Whip egg whites in a mixer with whisk attachment until frothy. Rain in granulated sugar slowly. Whip until the egg white is a soft peak. Add salt, vanilla extract and food coloring. 2. Continue to whip until a medium peak forms. Do not over whip. 3. Sift powder sugar and almond meal together. 4. Fold powder sugar and almond meal into egg white mixture. 5. Fold together until mixture is the consistency of slow moving lava. (About 20-30 seconds of folding.) Be careful not to over mix. 6. Fill pastry bag fitted with #828 tip with macaron mixture. 7. Pipe into small silver dollar size rounds on parchment covered sheet pans. 8. Once all rounds have been piped, allow it to sit out for 30 minutes to dry and create a shell. 9. Bake at 240 degree’s for 9-11 minutes. Rotate halfway through baking process so cookies are evenly baked. Cookie tops will pop up creating a macaron “foot” below the shell top. 10. Allow to cool before piping filling. 11. Fill with your favorite butter cream, preserve, or chocolate ganache filling. This recipe yields 40 French macaron sandwiches. Try them at home, or if you are in the LA area head over to the Vanilla Bake Shop and buy some instead! A bride’s search for THE dress is a daunting but exciting time. I had many mixed feelings about going wedding dress shopping: fear of not finding the right one, dread of feeling too fat to look good in them, joy at thinking of yourself on your wedding day, and relief that you are finally getting to shop for a wedding dress for an actual wedding for yourself! 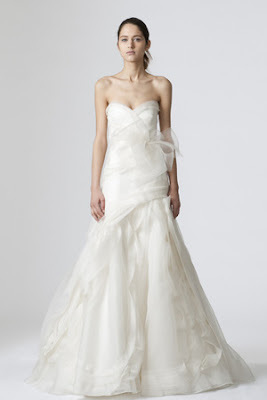 I had poured through bridal magazines tearing out pictures of gowns I loved for 5 months before I went gown shopping. My mom flew out to LA and we went to a couple of bridal boutiques in an effort to track down the perfect dress. It was such a memorable experience that we had together, and not just because of a Denzel Washington encounter that we had on our way home! In the end I found my perfect gown, the one I had loved most from my magazine ripping phase, and the first one I tried on. 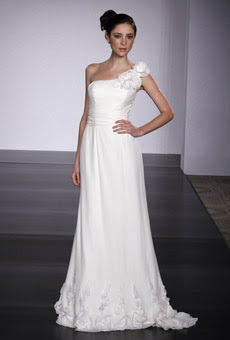 I am LOVING Vera’s 2010 Spring Collection! The Lela Rose gown would be so elegant worn in an urban wedding and the simple J.Crew gown has a beautiful back and would be great for a gallery venue. The simple Vera gown is perfect for a summer garden wedding or a beach ceremony. The Anne Barge gown is more beautiful in person and has amazing details (pockets and pleating on the bodice) that would make it perfect for a preppy, nautical themed wedding. 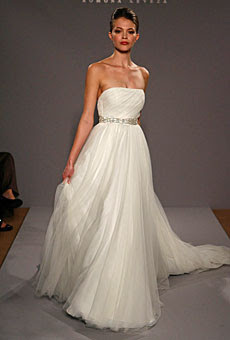 I love the neckline of the bottom Amsale gown and the polka dots in the bottom Carolina gown are adorable. Both short dresses would be perfect for a simpler affair, a city hall wedding, or as a second dress for a bride who wants to change for the ‘party’ portion of her wedding. 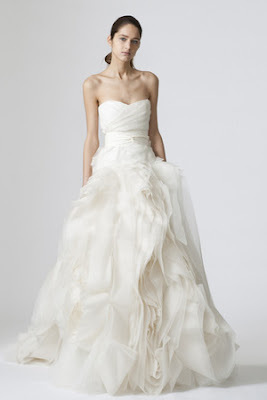 Both gauzy ballgowns are perfect for a more formal affair…or for any bride with an inner Cinderella. And my very favorite is the vintage inspired lace Melissa Sweet gown…because it was mine! One of the most important things I think any bride can do in planning her wedding is to come up with at least one DIY (do-it-yourself) project. 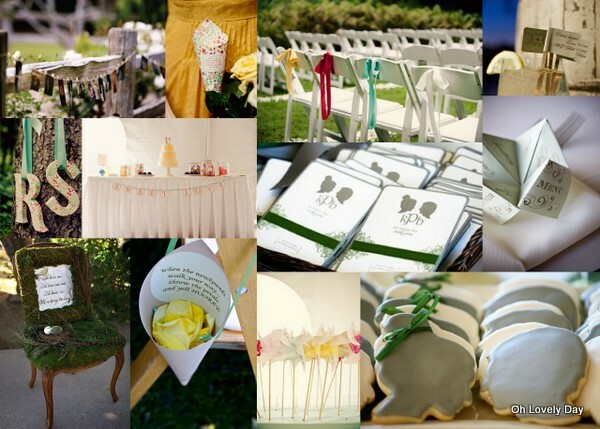 Whether it is your menus, programs, favors, or a cute extra project (or all of the above! ), DIY elements add a special touch to your wedding, show your guests you put time and thought into the elements of your wedding, add a little bit of ‘you”, and save you money! I am going to try whenever possible to post DIY projects or ideas for weddings that I have come up with or found on the blog circuit. 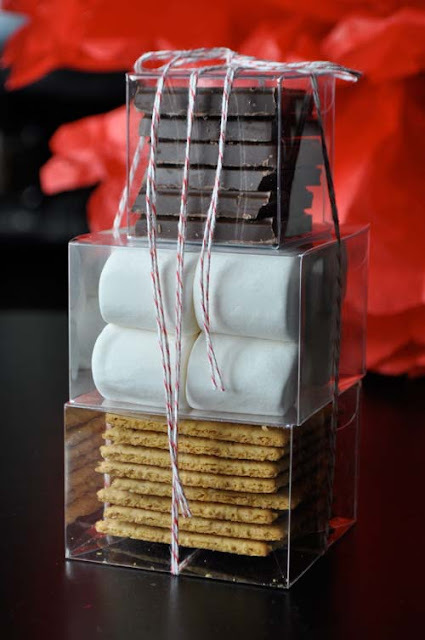 One of my favorite DIY ideas I have come across is actually quite simple – a s’mores kit. It would be a perfect wedding favor idea for a fall or winter wedding or an element to use in out-of-town bags for guests, not to mention a great gift for everyday use (think holiday gift, thank you gift, hostess gift…) How perfect would this project be as a favor idea for the winter inspired wedding previously featured!? Go to Twig & Thistle for full instructions here!